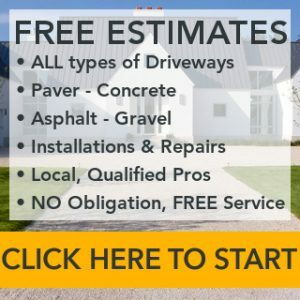 How much does a concrete driveway cost? The simple answer is more than an asphalt driveway and less than a paver driveway, but of course there’s much more to it than that! 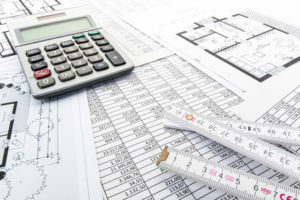 If you want to accurately estimate your concrete driveways costs before speaking to a professional contractor then read on. In this RenoCompare cost guide we will take you through the different pricing scenarios, give a clear breakdown of costs and detail a real life example. 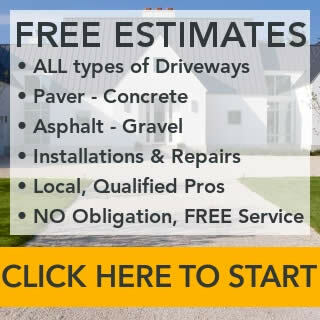 By the end of this post you will be ready to calculate your own concrete driveway estimate before requesting free quotes from our network of qualified driveway contractors. Let’s start with an overview of pricing, and then we’ll break it down to see how your concrete driveway costs will be determined. These are the four most common scenarios in order of cost for materials and installation for a new concrete drive. Note 1: When the original asphalt or concrete driveway was built properly, the subgrade and subbase layers should already be in place with little or no change required. If not, one or both of these layers will need to be installed. These variables account for the wide cost ranges in scenarios 3 and 4. Before a contractor gives you an estimate, it is possible that he or she might want to hand-dig alongside the existing driveway to view what lies beneath. Note 2: Most concrete driveways are built with 4 inches of concrete. Some homeowners prefer 6 inches of concrete for greater stability and durability, but the advantages might not be worth the extra cost unless you have very unstable soil or you plan to drive very heavy vehicles on the concrete. There are many steps to installing a concrete driveway. Not all of these will apply to your project. Asphalt drives are moderately difficult to break up and load; removing a concrete drive requires heavier equipment and more time. When installing a new drive, the turf and up to 10 inches of soil must be removed. Soil containing clay or expansive material is removed to a greater depth than soil containing large amounts of sand. The removed soil may be hauled away or relocated to another part of the property, at your discretion. Here are all potential layers with their costs. Subgrade layer: Up to 4 inches of sand, graded and compacted, are added where existing soils are unstable. Subbase layer: Up to 4 inches of 4-inch stone, gravel or crushed stone aggregate, graded and compacted, form the next layer in concrete driveways. Concrete: A minimum of 4 layers of concrete will be installed. Premium installations have up to 6 inches of concrete. Some installations are four inches thick in the middle with the last foot or so at the edges thickening to six inches for greater strength. The price lies between the costs for 4” and 6” layers of concrete. Concrete cures completely within four weeks. It should then be sealed to prevent staining and deterioration caused by moisture, especially where freeze/thaw cycles are common. Costs given so far are for basic concrete driveways. However, many driveway projects include additional costs, and we summarize those here. Wooded property: Removing trees and stumps, cutting up wood and hauling it away is a costly process. Excavation costs rise by 25% (lightly wooded, small-diameter trees) to 500% (heavily wooded, large-diameter trees, though such trees often have timber value and can be sold). Extra fill required: Fill dirt or gravel might be required to fill low areas or to lessen the pitch of steep driveways. The volume of fill required will determine the cost. Adding drain tile: Drain tile is often used to dry out wet areas near the driveway. Every job is unique, but a reasonable estimate is 15 feet of drain tile for every foot of driveway that has water standing adjacent to it. For example, an area affecting 12 feet of the driveway would require approximately 180 feet (15×12) of drain tile to resolve the issue. Low areas are generally not ideal for driveway construction without a massive and costly buildup of the driveway bed. Water can soften and erode the subgrade and subbase layers beneath concrete, with results including settling, sinking, cracking or collapsing. Permits: Driveway permits are required in most counties or cities to ensure that the location of the driveway offers all drivers good visibility. The cost of the permit includes an inspection to make sure the preparation and installation is handled properly. Tinting, stamping or acid-staining the concrete: These are popular ways to turn drab concrete into something unique. They can be costly, though. Cosmetic borders: Concrete driveways are sometimes bordered with acid-stained concrete (see above), paver stones or other decorative material. Retaining walls: Where a hillside has been excavated to form the driveway or the garage is partially below grade, retaining walls might be required to prevent soils from eroding or caving in. Retaining walls cost $25-$35 per square foot. For example, a wall 30 feet long and 4 feet high, 120 square feet, would cost $3,000 to $4,200. Educated consumers end up with better driveways and more competitive prices than others. Knowing what to expect when you get estimates will assist you in discussing the project with contractors too. 1). Start your estimate at the standard cost for your scenario based on the type of project you’ll be completing. Perhaps a breakdown of the costs for a recent concrete driveway installation will be of assistance as you develop your own estimate. This driveway project included many common elements with a few extras. The home is new construction in Eaton Rapids, MI, a suburb of Lansing. The land slopes slightly up from the street. The soil is composed of 4” of rich topsoil with sandy clay loam beneath. The driveway is 10’ wide from the street up the slope, a length of 35’, until it broadens to a parking pad in front of the two-car garage that is 25’ wide and 20’ deep. Driveway excavation: The topsoil was pushed off and piled to the side. Another 5” of soil were removed and hauled away. Material installation: A gravel pit and concrete plant are near the property, so there were no increases in trucking costs. Gasoline at the time was $2.59/gallon. The analysis of this job shows it would have cost $6.13/sf without staining. That is above the average in the range given above. This is accounted for the use of three layers of material. While there are plenty of concrete driveway estimates online, most don’t go into enough detail to be of use to homeowners. That’s why we’ve broken down all of the costs – it should assist you in compiling an estimate that is very close to what you’ll get from contractors. When you’re ready to get written quotes, it makes sense to contact at least three contractors in your area. Let them know that you want quality materials and installation, and that you are getting estimates from several companies. This approach will produce competitive estimates for a driveway that will be built properly without shortcuts. Ask for references, and make a few phone calls. Request the addresses of a two or three jobs the company completed 7-10 years ago. Drive by the homes, and look for telltale signs of poor work such as cracks, sunken sections and standing water on the surface. This will give you information about the quality and durability of the company’s work. The most important maintenance task is to keep the concrete sealed. Frequency of sealing varies by climate, but it is typically every 2-6 years. Ask your installer how often to apply sealer. This can be a DIY task, but calling professionals to do the work will help to ensure that the driveway is effectively cleaned and the sealer is properly applied. If your concrete cracks in the first few years, contact the contractor, and ask them to replace the section at their cost. Cracks must be addressed immediately, especially in climates where freeze and thaw cycles occur. The crack should be filled with a high-quality concrete crack filler. There are several different materials used, and a professional driveway contractor will advise you on the best product for your situation. When sealer is applied regularly and small cracks are addressed immediately, a concrete driveway should hold its good looks and performance for 25-35 years.